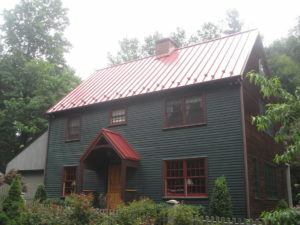 Hiring the right metal roofing contractors to work on your Baltimore area home is an important decision. Your roof is one of the most important parts of your home, and having a new one installed will likely be a significant investment. So, why would you entrust such an important task to some fly-by-night company? Instead, you should hire the experienced professionals at Roland Slate Service Company. We have been in business since 1989, and we would love to put our decades of industry experience to good use for you. One of the main things we bring to the table is our industry knowledge and expertise. However, that’s not the only thing that sets us apart from other metal roofing contractors. As a family-run company, we can provide a level of personalized service that many of our competitors simply can’t. During your free initial consultation, we will take the time to thoroughly examine your roof and take the necessary measurements, so that we can recommend a metal roofing product that’s right for you. Once a decision has been made, we will schedule the installation of your new metal roof at a time that works best for you. Our hours are very flexible and we are more than willing to work around your busy schedule to minimize interference with your everyday life. All of the metal roofing products we offer come with an industry-leading lifetime material warranty. On top of that, we stand by the work of our talented installation crew with a labor warranty, to boot. That means you can rest easy knowing that your new metal roof is completely covered. To find out firsthand why we are considered to be the premier metal roofing contractors in the Baltimore area, contact Roland Slate Service today.